← Agassi & McEnroe Kick Off L.A. With Stars Under the Stars. Farmers Classic: The “Glamour” of Qualifying. Farmers Classic Qualifying at Sycamore Courts. Far, far away from the drinks bar and air conditioned tents surrounding the stadium court at the UCLA Tennis Center where this year’s Farmers Classic is set to start tomorrow are the Sycamore Courts nestled up in the hills near Sunset Boulevard and Bel Air. But don’t let the location fool you. For it’s here that a more familiar and less glitzy part of professional tennis commenced this weekend that many ATP pros are all too familiar with – the qualifying rounds. Past champions and future hopefuls all play side by side to earn a coveted qualifying spot in the main draw. And what do they get for all their hard work? A few ATP ranking points and probably the unenviable task of playing the top seed in the first round. 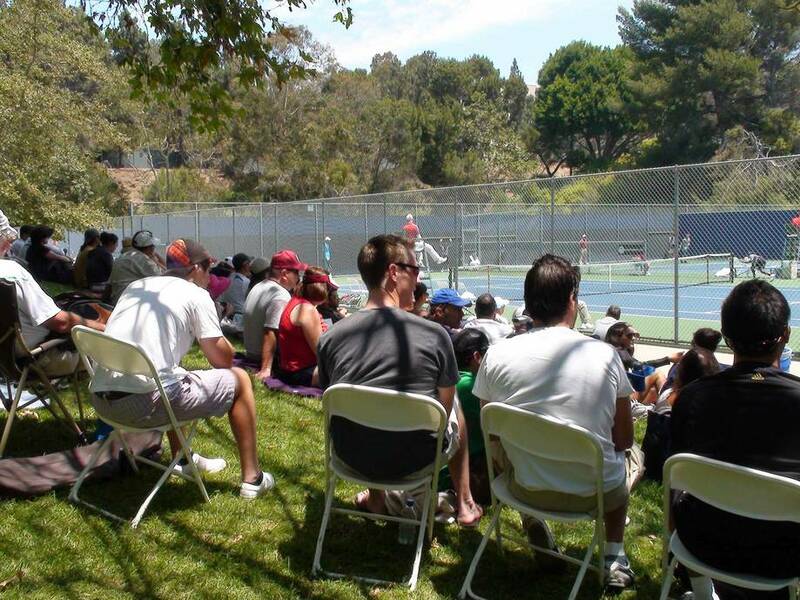 Out at the Sycamore Courts, fans can sit on a hillside facing the action which can be distracting for the players since applause can erupt at anytime for players on the court next to you (and while you’re trying to serve). Add in stray balls dropping in from other courts, barking dogs and children playing and one can’t blame a player for wishing for the calm oasis of the main stages of a tournament where ringing cell phones and talking during points are frowned upon. No matter. The players, many of them promising youngsters ranked outside the top 100, 200 or even 300, soldier on in the hopes that their efforts will earn them a spot in the main draw which means more points and better chances to get into bigger events down the line. All the while hoping that there’s enough cash left over to pay for hotel rooms and plane tickets unless they are some of the lucky ones to have sponsors willing to hang around to see if their talent develops into stardom. Ryan Harrison Walks Off Court After Losing to Chris Guccione. 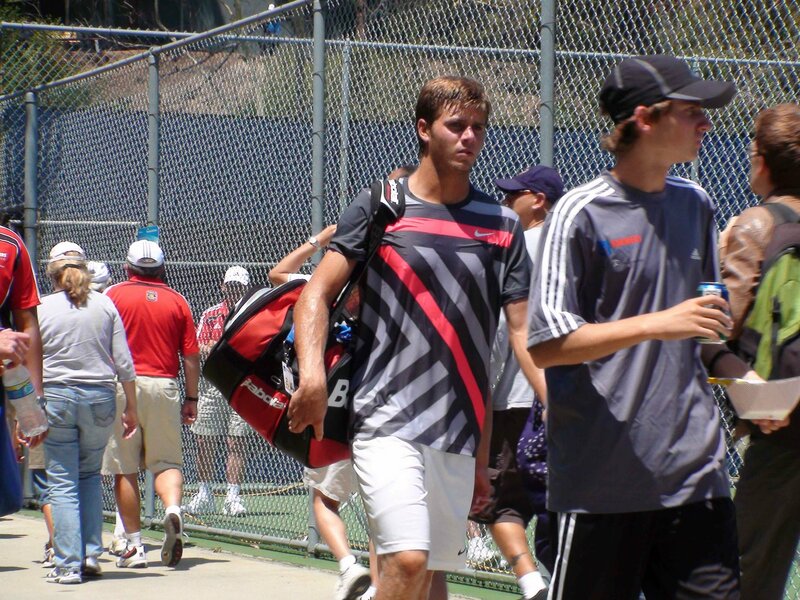 One of those playing today was 18 year old Ryan Harrison from Shreveport, Louisiana, who, along with many other young Americans also playing in the qualifying at L.A., has been picked as “one to watch” by many hopeful tennis watchers who feel Harrison could become the next great U.S. player. Harrison, ranked 218, who got to the quarterfinals of Newport a few weeks ago, played well against No. 308 Australia’s Chris Guccione, but it was Guccione’s booming serve and soft hands at net that allowed the Aussie to edge out Harrison 7-6(4), 7-6(3). After the match, Harrison and Guccione walked off of the courts and over to a bit of grass where players could either get massage or treatment, as Guccione did to get ready for his next match, or just to have some space to figure out their next move. That’s what Harrison did as he sat down in a chair far away from everyone else to make a few calls on his cell phone and then talk to his coach. It was as if Harrison had already moved on from the loss and was trying to figure out his next move or next tournament to fly to. Eventually, Harrison packed his things and started walking alone up a paved incline that led away from the courts up to the parking area above. I couldn’t help but think that walk for Harrison is much like his journey in trying to climb up the ranking boards of the ATP tour. Despite all the hope and hype (for better or worse) he will receive from the tennis media and U.S. fans eager to cheer for a new champion, the climb will be Harrison’s alone in the end. As for Guccione, he will now play another American, Steve Johnson, for one of four qualifying spots into the main draw. And what do these men get for all their efforts? If they win a qualifying spot, they earn 12 ATP ranking points but no cash. Finalists in the qualifying round receive $1000 dollars. Those like Harrison, who just made it to the second round, get $470 dollars. Comments Off on Farmers Classic: The “Glamour” of Qualifying.